S. is a 24-year-old housewife. Her husband is a daily laborer, meaning he only gets paid around $1.40 a day when there is work. Her husband recently had an accident at work and has been jobless since. He cannot work because of his injury, so they have been receiving help from her in laws to survive. 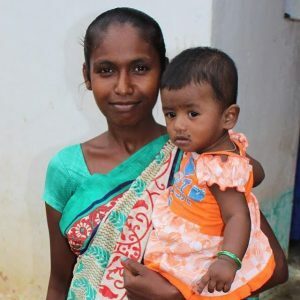 S and her daughter, who is 8 months old have been receiving nutrition from Rescue Pink for 5 months now. She has noticed a significant difference in her two children saying her baby girl is much more active and bigger in size. S is also now healthy thanks to the nutrition and no longer falls ill. Rescue Pink has taught her how to take care of her children, and how to prepare nutritious foods for her family at home. S desires to open a small provision shop to help her family out. She would like to join Rescue Pink’s entrepreneurship program in order to accomplish her dream. We are so thankful that you give to Rescue Pink to help operate our Pregnancy and Lactating mother’s group at our centers. This enables us to meet immediate needs while gaining trust with the mothers to encourage them to rescue their daughters by joining our Women’s Entrepreneurship Program. Here they can learn life-long skills to help sustain their families and provide for their girls rescuing them from infanticide, childhood death by malnutrition and disease, or trafficking and child marriage. Meet B - "You Saved My Life!"